If you are like most of our customers, you have a lot of questions about designing an effective direct mail marketing piece. 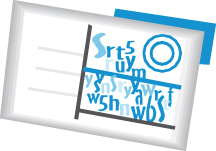 Should you use a post card, a self-mailer, or an envelope? Use lots of copy or lots of white space? Announce who the mail is from or build the reader’s curiosity? With so many variables to consider, where does one begin to seek the right answers? To help sort through the maze of interlocking decisions, remember that there are two ways to judge how well a direct mail piece has been designed. One set of standards comes from the discipline of good graphic design; the other comes from what makes mail move efficiently through the mail stream. We believe both are important, and that a good strategy is to thoroughly understand each set.